What Is the Difference Between a Male & Female Bluebird? If you see a blue and orange bird in your backyard feeder, you may be looking at a true bluebird. Depending on where you live, it could be an eastern bluebird (Sialia sialis), which lives east of the Rockies, a western bluebird (Sialia mexicana), which lives west of the Rockies or a mountain bluebird (Sialia currucoides), which true to its name, lives smack-dab in the middle of the Rockies. The bird you see also might be a blue jay (Cyanocitta cristata), a blue grosbeak (Passerina caerulea) or an indigo bunting (Passerina cyanea), but while these birds are definitely blue – sometimes dazzlingly so – they aren't bluebirds, and their Latin names tell you so. 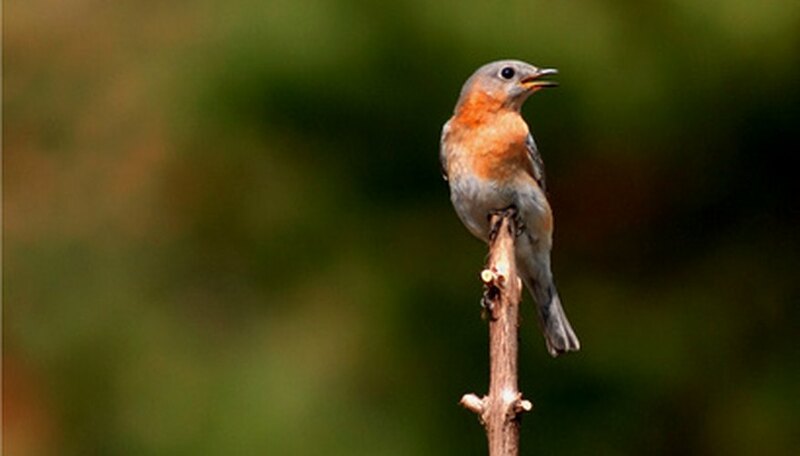 Moreover, few of them have the orange coloration that distinguishes both a male bluebird and a bluebird female. Bluebirds belong to the thrush family (Turdidae), which includes the robin and songbirds such as the blackbird and mockingbird. Thrushes are not large birds, and bluebirds are small, even for thrushes. The three species of bluebirds in North America – which is the only place in the world you'll find them – all belong to the same genus, Sialia. They are sparrow-sized, having a length of 6 to 8 inches and a wingspan from 11 to 14 inches. Eastern bluebirds tend to be slightly smaller than birds of the other two species, and their coloration is slightly less dramatic. That fact makes it a little more difficult to differentiate the male bluebird of this species from the female, but no matter which species you see, the most dramatic coloration belong primarily to the males. The three species that inhabit North America are more or less uniform in size and appearance, although there are differences between them. The eastern bluebird is a little smaller than its counterparts. If you just want to be able to tell a male bluebird from a bluebird female, that's easier to do if you're looking at a mountain or western bluebird through your binoculars. When it comes to eastern bluebirds, the differences between males and females are more subtle. If you dipped a male bluebird in bleach, it would look like a female. In general, the male bluebird displays bright blue plumage on its back and orange coloration on its chest, although the chest coloration of the male mountain bluebird contains more white than orange. The male bluebird also has a few orange or brown feathers on its wings and tail. The bluebird female, on the other hand, does not have such dramatic colors. The blues, instead of being iridescent, are light and confined mainly to a few feathers on the wings and tail. The main colors of the bluebird female are orange, beige and white. Bluebirds nest in tree hollows, old woodpecker holes or in rocks and crevices anywhere from 2 to 50 feet above the ground. 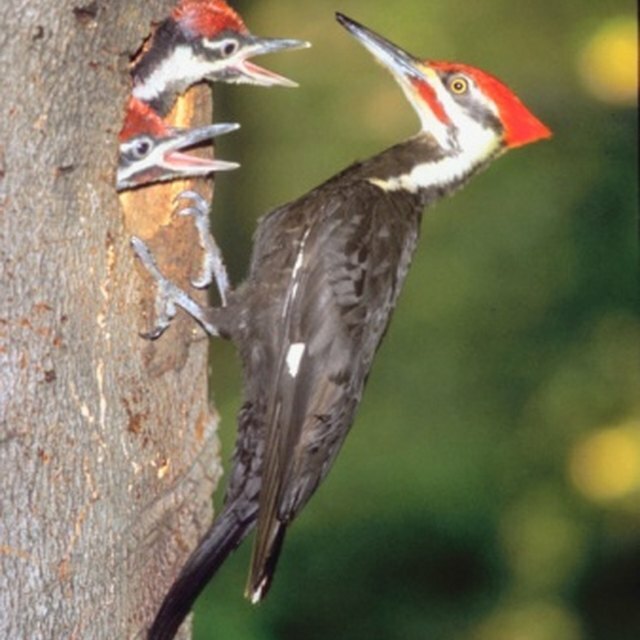 If you have a birdhouse, it's a likely place for them to build their nests. If you happen to spot a nest, you should be able to tell the male bluebird from the female by observing their behavior. The female is usually hard at work building the nest. It's her job to select the nesting site and build the nest. The male, on the other hand, is likely to be engaged in boisterous activity, such as fluttering and spreading its tail feathers, in a courtship display. It may also be preening the feathers of the bluebird female or even feeding her. If you hear one of the birds singing, take a close look to see which it is. It's probably the male. Deziel, Chris. "What Is the Difference Between a Male & Female Bluebird?" Sciencing, https://sciencing.com/difference-between-male-female-bluebird-5986069.html. 25 July 2018.